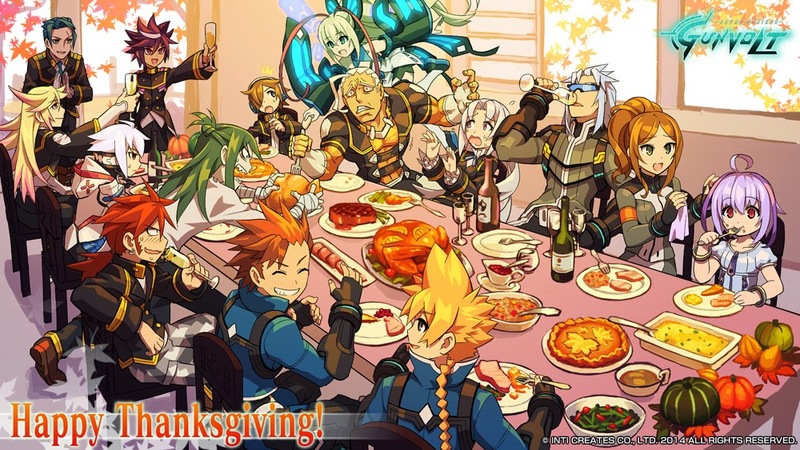 Inti Creates is kicking off Thanksgiving with a nice helping of Gunvolt news. First and foremost, here's a brand new trailer for Mighty Gunvolt version 2.0.0. Version 2.0.0 and the DLC will release alongside Mighty Gunvolt as a stand-alone game on Friday, November 28th. It will run you $3.99. Two Gunvolt themes are due to hit the 3DS this Friday for $1.50 a pop. The first theme features Gunvolt striking an action pose, with sound effects straight from the game, and the Stage Select BGM playing in the background. The second theme unites all three playable Mighty Gunvolt heroes with 8-bit sound effects from the game, a chiptune version of “Formulate the Battle Plan”, and scrolling effect that moves the characters as you page along the bottom screen. Desktop in need of a festive wallpaper? Look no further -- Inti Creates is offering up a Thanksgiving-themed Gunvolt wallpaper. You can download it at the Azure Striker Gunvolt homepage in various sizes. Lastly, Inti Creates promises more announcements on Friday. No clues or hints what's in store, but we'll be keeping an ear to the ground. Hang tight! Maybe a discount in Gunvolt?! I hope they confirm a release date for the EU version..
What is it with Inti Creates, putting on visor-glasses to their long-haired guys (Giro & Asimov)? Very uninspiring. Not against the visors or guys with long-hairs though, it is just that when they paired those two together makes me go eeeeh! Well, let's see if they ever come up with another new IPs (not Gunvolt), will they do it again? Okay, so I've downloaded the 2.0.0 update and tried accessing the downloadable content. Whenever I wasn't getting error messages, I've come to find out that the DLC apparently hasn't been added yet? What gives? It was scheduled for release today, wasn't it?